NEW JERSEY CITY, N.J. (October 12, 2015) – The spectator experience was breathtaking. The racing conditions were fantastic. And the talent on display in New York Harbor was remarkable. The 2015 U.S. Adult Sailing Championship wrapped-up on Monday after three exhilarating days over Columbus Day weekend. In what was described as a “miracle race” by Eric Leitner, the host club representative from the Manhattan Yacht Club edged out a competitive field in the final race of the regatta to win the Clifford D. Mallory Trophy. Placing just two points behind Leitner in second place was Mark Hillman of the Chesapeake Bay Yacht Racing Association, who was in the lead entering the 12th and final race. Leitner’s crew included Adam Sandberg, Doug Witter, and Michael Ambrose, and Tom Sinatra. The come-from-behind win was capped off when Leitner’s team finished second and first in Monday’s two races. They were eight points behind Hillman when the day started. Hillman posted a pair of seventh place finishes on Monday. Carter White of the Northeast Sailing Association also had a strong finish by placing first and second on the final day. The top three teams were separated by just five points. “We probably had about three and a half knots of current out here, so it was pretty crazy,” mentioned White. “In only four or five knots of breeze, that made things difficult. We had some interesting mark roundings where you had to sail past the mark and pray you could get around it. It made it challenging but everyone had the same body of water to sail in. “It’s just great to get in equal boats with people of equal skill sets, which made for some close racing. 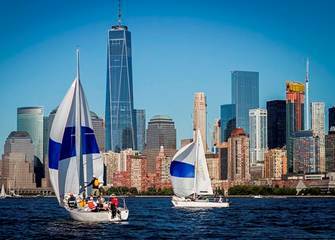 Fourteen teams battled it out in this historic US Sailing Championship, hosted by the Manhattan Yacht Club. Teams were comprised of both men and women in J/24 class sailboats. Regional Sailing Associations (RSA) selected their respective teams to compete. With the Manhattan skyline and the Statue of Liberty as the picturesque backdrop, spectators enjoyed the viewing from the shoreline of Liberty Park and from Ellis Island. For standings, photos, Twitter updates, and more information from the 2015 U.S. Adult Sailing Championship, please visit the event website.